The constants in the above formulas are for a pH of 7.5 (which is the only parameter that significantly affects these constants). With the spreadsheet I can easily calculate the constants for other pH, but remember that the above formulas are approximate. For example, with FC of 3 and CYA of 15 the formula gives HOCl as 0.098 when the correct answer is 0.095. That's not terrible (about an 3% error). However, with FC of 5 and CYA of 15 the formula gives HOCl as 0.239 while the correct answer is 0.199 (about an 20% error) which isn't as good. J. O'Brien, J. Morris and J. Butler, â€œEquilibria in Aqueous Solutions of Chlorinated Isocyanurateâ€, Chapter 14 in A. Rubin, ed., Chemistry of Water Supply, Treatment and Distribution, 1973 Symposium, (published 1974), Ann Arbor Science, Ann Arbor, MI, pp. 333-358. NOTE: The mechanism of protection of chlorine from sunlight by CYA is currently under review in this post. Higher CYA levels may protect even proportionately higher levels of chlorine more, especially in deeper pools. The following graph combines the two concepts of needing more chlorine at higher CYA vs. the greater protection of chlorine by CYA. The graph shows the total chlorine (FC) loss rate in ppm/hour vs. CYA at different HOCl levels. Remember that this rate of loss will slow down as chlorine gets used up. Nevertheless, [EDIT] while in theory [END-EDIT] the absolute loss of chlorine is greater at higher CYA levels (keeping HOCl constant) and is the downside to a "high CYA & high Chlorine" approach, [EDIT] in practice there is some sort of CYA shielding effect such that higher FC and CYA levels at the same FC/CYA ratio lose less absolute amounts of chlorine (see this post later in this thread and see Mark's experiments in this post and this post [END-EDIT]. However, the primary reason to have higher CYA and Chlorine is to have a sufficient buffer of chlorine to prevent it from dropping to dangerous levels. There is obviously a tradeoff here. Though using no CYA results in the least amount of chlorine loss, the fact is that you simply can't maintain a pool with only 0.05 ppm chlorine everywhere in it -- hence a minimum level is needed as a buffer. The link to the spreadsheet (in a ZIP file) that calculates all of the above data is PoolEquations.zip and was last updated 14-Mar-2009. It also does some of the things that BleachCalc does, but is not for novice users. OK everyone. Here are some graphs I put together so now you can give me feedback as to whether this is what you are looking for. First, I show the traditional HOCl/OCl- relationship on the left including a total line (for HOCl + OCl-) that is always at 100%. It should be noted that the chart on the left is valid for any Total Free Chlorine (FC) level. The chart on the right shows the same situation when there is 30 ppm CYA and in this case the Total Free Chlorine (FC) level matters and is 3 ppm for this chart though when CYA >> FC it is roughly the ratio of CYA to FC that determines HOCl and OCl- levels. Also note that the percentage of disinfecting chlorine (HOCl) at a pH of 7.5 fell from about 50% on the chart on the left to around 1.5% on the chart on the right. Note that the total HOCl+OCl- level is not 100% when CYA is present. The difference from 100% (the Cl-CYA curve) is the amount of chlorine "bound" to CYA and though it is better protected from degradation from sunlight, it is also not immediately available for disinfection or oxidation (but is available "in reserve" as HOCl gets used up). 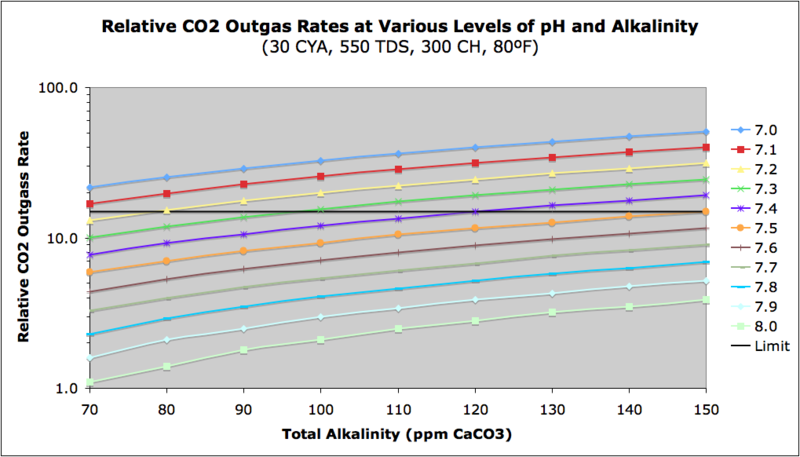 Finally, notice how much "flatter" the HOCl curve is in the graph on the right indicating that the presence of CYA has made the amount of HOCl less sensitive to changes in pH (though we really need to look at a log scale for relative changes -- more on that next). If we want to see changes in disinfecting chlorine (HOCl) in percentage terms, then a logarithmic scale is more appropriate so that equal distances on the chart represent the same relative amount of change. That is, it answers the question of how much improvement there is in the relative amount of chlorine when you lower pH. It is not quite as obvious in this graph, but the HOCl curve is a bit flatter on the right with CYA present, though at lower pH at around 7.0 the pH sensitivity of HOCl is about the same at 30 ppm CYA as it is with no CYA (and below 7.0 the pH sensitivity of HOCl is actually greater with 30 ppm CYA than with no CYA, but this is mostly due to the fact that with no CYA and at low pH most of the chlorine is already HOCl so there's no room for relative "growth"). Also note that at higher pH above 7.5 that the presence of CYA allows one to operate at higher pH without losing that much chlorine effectiveness (without CYA the effectiveness of chlorine drops rapidly above pH 7.5). The graph on the left cannot show the 0% flat line for Cl-CYA since it is off the chart (the 0% is at negative infinity since this is a logarithmic scale). It is interesting to note that the traditional HOCl/OCl- graph with no CYA showed the large variation in HOCl percentage vs. pH, but that this was rather pointless (for pools; not for drinking water disinfection) because the absolute concentration of HOCl was typically so large that it didn't really matter if only 10% of the total was HOCl. The minimum HOCl concentration for preventing algae is on the order of 0.05 ppm (disinfection minimum is around 0.01 ppm) whereas even a pool with no CYA and a pH of 8.4 (which is only 10% HOCl) with even a low total FC of 1 ppm still gives 0.10 ppm HOCl which is double where we normally run our pools today when we use CYA! I'll do this in words and in symbols. Adding bleach is a basic process; it is the using up of bleach (chlorine) that is an acidic process so the net result is almost neutral. When I said "chlorine usage" I didn't mean your using chlorine (i.e. adding it) -- I meant when chlorine gets used up by "doing its thing" or "breaking down". Sorry for the confusion I caused. Sodium Hypochlorite (liquid chlorine or bleach) combines with water to produce sodium ions (part of regular table salt) plus disinfecting chlorine plus hydroxyl ion. The hydroxyl ion makes this a basic reaction that raises pH, but because the disinfecting chlorine is a weak acid this overall reaction raises the pH by less than a strong base would. Note that there is a small amount of extra base in the form of Sodium Hydroxide (lye or caustic soda) that comes with Sodium Hypochlorite and is there to help preserve it, but this amount is rather small. Chlorine breaks down in the presence of ultraviolet radiation, such as found in sunlight, and forms oxygen gas and chloride ion (and hydrogen ion, if starting with HOCl hypochlorite). Because a hydrogen ion is produced, this is an acidic process, but since disinfecting chlorine is a weak acid, only some of it breaks down in a way that lowers pH as shown above (i.e. only HOCl produces H+; OCl- does not). During the process of chlorine breakdown by sunlight, there are hydroxyl (OH•), oxygen anion (O-•) and chlorine (Cl•) radicals that are also produced as short-lived intermediates (technical details in this post). This can help oxidize organics in the pool. The disinfecting form of chlorine (HOCl) combines with ammonia through a series of reactions (that I have not shown) with the net result being the production of nitrogen gas (which is why it is important to keep your cover off and have good circulation when shocking) plus hydrogen ion and chloride ion. Though by itself this would be a strong acid reaction, there is also OCl- present that will combine with hydrogen ion to form more HOCl since the ratio of HOCl to OCl- will remain constant (and is about 50/50 at pH 7.5). So the net reaction is acidic, but not strongly so. Further technical details are in this post. The net reactions are as follows if you combine the ones I showed above. So the overall net reaction of adding sodium hypochlorite to your pool and having it used up in its most typical ways is simply to produce salt (yes, sodium chloride or table salt, dissolved in water, of course) and either oxygen or nitrogen gas (and water). If you do not have enough chlorine in your pool relative to your bather load (ammonia demand), then the chlorine may not completely oxidize ammonia and instead you will get chloramines (first, monochloramine). This reaction is basic. However, sunlight may break down monochloramine which will result in the rest of the breakpoint process which overall is acidic (so it's the same as I showed above overall). It is also possible for chlorine to combine with organic compounds to form chlorinated organics that are hard to breakdown. When people talk about the health problems with chlorine, it is usually about some of these chlorinated organics (Disinfection By-Products, DBPs) known as Tri-Halo-Methanes(THMs) such as chloroform. Also, some chloramines such as nitrogen trichloride (NCl3) not only smell bad, but can cause health problems (especially in indoor pools with poor air circulation). In an outdoor pool exposed to sunlight and with a good residual of chlorine you typically don't get these "bad" compounds. If you are really concerned and have money to burn, you can use a constant maintenance level of non-chlorine shock (monopersulfate, MPS) to oxidize organics before chlorine gets a chance, but this is probably overkill for an outdoor pool (though may be a good idea for an indoor pool). Note that the products of HOCl and OH- are exactly the same as you get when you add liquid chlorine or bleach (ignoring sodium ion). This process is partly basic, but not strongly so due to the HOCl weak acid. So the overall net result in a salt pool is simply the production of oxygen or nitrogen gasses. The disinfecting chlorine that was created from chloride ion gets converted back to chloride ion as it is "used up". The chlorine is not "seen" in the above net reactions because the chloride that became chlorine goes back to being chloride again. The oxygen gas comes from water when chlorine gas dissolved in it (i.e. from hypochlorite ion or hypochlorous acid) while the nitrogen gas comes from the ammonia (the oxygen or hydroxyl in the chlorine reverts back into water in this case, using the hydrogen from the ammonia to do so). On page 5 of the following link is a summary of results from the "Commercial Spas Study, Portland, Oregon". The following linked table shows this same data, but with an extra column I added where I calculated the ppm of HOCl (using a temperature of 104ÂºF for spas). I also resorted the table in order of decreasing HOCl (the table in the link is sorted by ORP). It appears that HOCl is about as good if not a little better than ORP except for one case where the FC was low (0.83), the CC was high (1.04) and there was no CYA (0). Perhaps the chlorine demand was used up at some point or the high CC had some adverse effect, but the low ORP (564) with chlorine present without CYA is certainly strange. Having a rule of a minimum of 0.011 ppm HOCl and a minimum FC or 1.0 (or perhaps 2.0) would work slightly better than the ORP rule of having a minimum of 650 mV. Of course, this is just one study, but I can't seem to find any other data as comprehensive as this. When I first started looking at ORP, I was shocked to find how inconsistent it was even from the same source. The rather definitive work by Clifford White called "The Handbook of Chlorination" had inconsistencies as did several different manufacturers. Before looking at the absolute ORP to ppm Chlorine readings, I first looked at something that shouldn't vary that much between ORP sensors and that was the amount of mV change for each doubling of ppm of Chlorine (everything else constant, including pH, TDS, etc.). The following table shows the results. I have put the sources for each as a link where appropriate. I also developed formulas for each of the manufacturers ORP vs. ppm Chlorine relationships and they also vary in absolute ORP readings by large amounts. It appears that the most accurate and consistent and carefully controlled and measured readings were from the Chemtrol (SBControl) paper so that is what I have used in my spreadsheet though I no longer prominently use ORP and have relegated it to a minor section of the spreadsheet. This also does not mean that I believe they make better sensors than the others (I simply do not know). The following shows the variation in absolute ORP for these same sources. Unfortunately, Clifford Whiteâ€™s Handbook of Chlorination is inconsistent even when measuring the same waters under the same conditions. The chart in Figure 4-18 that shows the relationship between ORP and pH shows at a pH of 7.5 (the same as Figure 4-19) ORP readings that are 35 mV lower for all cities (i.e. Petaluma at 2.1 ppm is 680 mV) and 165 mV lower for distilled water (i.e. at 1.8 ppm is 610 mV). So what's the bottom line? I agree with Ben that though ORP is measuring something, namely the oxidation potential of the water, that this is not necessarily the important thing to measure or that it is not always measured accurately or consistently, etc. It should be noted that this is a rather controversial assertion to make as an entire ORP industry was created on the basis of ORP being the superior measurement to use, but when people looked at studies, such as the Commercial Spas Study mentioned earlier in this post, they only compared ORP to variables such as Free Chlorine (FC), CYA and pH as individual variables (possibly through correlation analysis) and it does not appear that anyone looked at theoretically calculated HOCl levels from those same variables (as I did, again results are earlier in this post). It is possible that some combination of HOCl concentration with H+ (pH) concentration determines the rate of disinfection and oxidation, but that is something I will have to look at later, probably using the Commercial Spas Study data since that's all I've got right now. After accumulating multiple pieces of conflicting evidence, I think it's about time to discuss and investigate the mechanism of how CYA protects chlorine from sunlight. The starting point for the theory, that I'm starting to think is only partially correct and needs to be enhanced, is that the chlorine that is in the form of hypochlorous acid or hypochlorite ion breaks down in direct noontime sunlight with a half-life of around 35 minutes while chlorine that is attached to Cyanuric Acid (CYA), also known as chlorinated isocyanurates, breaks down from the sun with a half-life of around 8.4 hours. 1) Some users, most notably Janet (user name Aylad), report that in their non-SWG pools using high levels of CYA shows dramatic improvement in chlorine's staying power. In Janet's case, with a CYA below 60 she found that the FC would go from 7-8 to 2-3 in one day (5 ppm FC per day) while with a CYA of 80-90 the FC would go from 8-9 and take 3 days to go below 5 (about 1.2 ppm FC per day). That is a huge improvement that is wholly inconsistent with the graph. 2) Several users of SWG pools have found that raising the CYA to higher levels, especially approaching 70-80 that some manufacturers recommend, has a dramatic increase in FC levels at the same SWG output. Though one theory is that the CYA makes the SWG cell more efficient by combining with the generated chlorine in the cell "hiding" it from the plates in terms of equilibrium (thus making the generation proceed more quickly), an alternative explanation proposed by some is that the higher CYA levels simply protect the chlorine from destruction from sunlight at a rate faster than the baseline theory outlined at the start of this post. I've been thinking of mechanisms that might explain the above data and that could be added to the theory to make it predict more accurately. One possibility is that CYA itself is able to absorb UV radiation and possibly re-radiate it as non-UV radiation at lower energy, with the rest of the energy becoming kinetic (i.e. heat or temperature increase). This link shows that indeed CYA does absorb UV at the pH found in pools, though it absorbs even more in more basic/alkaline solutions. If one adds direct CYA absorption and essentially shielding of UV from lower depths of the pool, then the "CYA shielding chlorine" description would in fact be accurate for this mechanism (while it is not accurate to describe the chlorinated isocyanurates which do not "shield" chlorine but are distinctly different molecules with different absorption rates and affect disinfecting chlorine levels). The net effect of this new mechanism would be to have higher CYA levels reduce chlorine loss at a greater rate than shown in the graph I linked to at the top of the post. So how can we prove that this new mechanism exists (or is likely) and explains what is being reported in (1) and (2) above? Let's start with the easier of the two, namely the second item of whether CYA improves SWG cell efficiency. This can readily be determined by comparing SWG FC output at different CYA levels, BUT with no sunlight shining on the pool (i.e. either at night or with an opaque cover or with an indoor pool). To the degree that CYA increases the SWG cell output to generate higher FC levels, then this leads credence to the efficiency theory; if not, then the protection from degradation from sunlight is more likely. As for whether CYA "shields" chlorine through absorption of UV (clearly it does absorb some UV, but the question is more one of whether this is a significant mechanism in quantity), this should be a function of the depth of the pool. The presence of higher concentrations of CYA essentially lower the density of UV radiation reaching lower depths in a pool. So this protective effect of CYA should show up more in deeper pools where a significant fraction of the water is at greater depths and should be less effective in shallower pools. The chlorinated isocyanurates, on the other hand, do not have this same effect since they do in fact degrade (the chlorine attached to them degrades to chloride ion) and are in fact less likely to interact with sunlight in this way so light is more likely to continue to lower depths (i.e. it doesn't act as a shield and even if it does, it's a much smaller concentration than unbound CYA itself). The experiment would be harder and would require measuring the difference in the destruction of chlorine in waters of different depths at varying CYA levels. The half-life of the chlorinated isocyanurate would be the dominant factor in the shallowest basin of water while CYA's "shielding" effect would be a greater factor in the deepest basin of water. where µ (mu) is the absorption coefficient and is a function of wavelength (so the above formula is for a specific wavelength). "l" is the path length which for the units in the links I referred to is in centimeters. where Îµ (epsilon) is the molar extinction coefficient, c is the molar concentration in moles/liter, and l is the path length in centimeters. So to get any reasonable absorption from CYA (so that µ is near 1/91 so at 91 cm we have µ*l = 1) we need µ to be over 10. This source gives an extinction coefficient (for gaseous HOCl) of 123 M-1cm-1 with an absorption peak at 220 nm. This source gives an extinction coefficient for hypochlorite (OCl-) of 350 M-1cm-1 at 290 nm. This link has graphs that show the molar absorption coefficient for both HOCl and OCl-. It looks like CYA absorption will protect HOCl from breakdown more than OCl- though both are protected (so in theory that implies that lower pH has less chlorine loss which is also true due to the greater photolysis of OCl- and correspondingly shorter half-life). This link gives an extinction coefficient for Cyanuric Acid (CYA) of 6.283 OD220 units · ml · µmol-1 which implies 6283 M-1cm-1 at 220 nm. The link given earlier that showed graphs of CYA absorption are consistent with this measurement, but the absorption drops rapidly at higher wavelengths and it is not clear at which wavelengths HOCl dissociates (breaks down from UV). and the rate constant (k) is presumed to be proportional to the intensity of light. This link provides interesting detailed information about chlorine (and bromine and chlorine dioxide) in terms of half-life at various depths (no CYA present). Interestingly, there is quite a difference in half-life by depth at higher concentrations of Dissolved Organic Carbon (DOC). Chlorine itself can shield lower depths, but it is unclear what the overall net molar extinction coefficient is independent of wavelength. The numbers in the chart with the lowest DOC show an absorption coefficient of 0.010 at 1 meter, 0.0081 at 2 meters, 0.0067 at 3 meters and 0.0057 at 4 meters. These numbers are not far of from the absorption of water itself as seen in this link though the DOC may certainly be a contributor. Thus, the chlorine is most depleted from water near the surface so having good circulation is essential in order to keep chlorine levels more uniform throughout the pool. It also appears, from the pH dependence, that perhaps hypochlorous acid (HOCl) is less susceptible to breakdown from sunlight than hypochlorite ion (OCl-). This implies that having a pool at lower pH results not only in more disinfecting chlorine, but has the chlorine last longer (though the effect may not be very strong from, say, 7.8 to 7.2). So to see the dramatic change seen from higher CYA levels, the CYA shielding effect has to be strong enough to be the predominant effect. The shielding effect would "shield" not only unbound chlorine, but also chlorine bound to CYA. Note that using an extinction coefficient of 20 in the above table one finds the difference between 50 and 90 ppm CYA being a factor of 3.7 which is not far off from the factor of 4.2 that Janet was seeing. So perhaps adding an additional protection factor similar to the "20" column in the above table might be the thing to do. This link indicates that the chlorinated isocyanurates are unstable in sunlight, but it is unclear how much of that is due to breakdown from the equilibrium hypochlorous acid vs. direct breakdown itself. The study just shows that CYA is itself stable in sunlight. If the CYA absorption effect is really this strong, then deeper pools should be more protected at the same CYA level since more of their water volume will be at deeper depths "shielded" from the UV. An experiment using shallow depth water with different levels of CYA will help isolate the two effects. If the CYA "shielding" or absorption is the main effect, then there should be little protection of chlorine in shallow water. If instead the chlorine combined with CYA has a longer half-life and that is the main effect, then higher CYA levels even in shallow depths should show significant protection and should roughly follow the curve in this graph. I suspect that there will be a some of both processes going on. The original CYA patent by Fuchs may be seen at this link. There were interesting laboratory tests that appear to have been made at shallow depths and only show a small amount of the "depth" variation one sees with higher chlorine levels. The UV lamp they used appeared to have 1 ppm FC drop to 0.5 ppm FC in 1.7 hours so was not as strong as sunlight. The rate of chlorine loss seemed to track the amount of unbound chlorine, but with diminishing returns starting at a rate of 0.29 per hour at no CYA, 0.16 per hour with 1 ppm CYA, 0.13 per hour with 2 ppm CYA, 0.092 per hour with 5 ppm CYA, 0.071 per hour with 50 ppm CYA and an actual increased loss of 0.088 per hour at 100 ppm CYA. This is somewhat consistent with the original theory of a 35 minute half-life in direct sunlight with no CYA and an 8.4 hour half-hour limit when bound with CYA. This is probably where the industry got its original data for its tables. Note that CYA also has a protective effect on chlorine loss from oxidation of iron and copper. Though the patent speculates CYA may coat metals, it appears that the effect is explained by the reduction in disinfecting chlorine and therefore the rate of corrosion based on its concentration. It should be noted that in the patent "real pools" showed the greater protection effect of higher CYA levels by about a factor of 2 at 10 ppm CYA and over a factor of 3 at 50 ppm CYA. Thus there does appear to be a "shielding" depth factor for CYA protection separate from that explained solely by Cl and Cl-CYA breakdown. The fact that the chlorine levels were the same and only the CYA level increased, yet had a greater effect in a real pool with "depth" is very strong evidence. The good news with this new information is that at sufficiently high CYA levels using a higher FC (to compensate for disinfection and prevention of algae) should not result in larger losses. Going from 30 ppm to 90 ppm requires about triple the FC level, but the loss rate may be cut down by a factor of 7 for a net overall savings of over a factor of 2. If we can validate this, then it should be possible to run a high CYA pool with high FC levels economically, especially in deeper pools. so that as µ approaches 0, "I" approaches "Io" as expected. A couple of comments on the above. There is 2 ways to control pool chemistry, reactive or predictive. have proven somewhat more accurate. that strikes the pool, in a heated pool this of course won't apply. must be running for the SWG to work. a way to run a wire to get my pool water temperature. minute by minute. The system I am testing is, to use a predictive set of parameters to control Chlorine addition(generation). of SWG run time. In the summer I have to make a correction for pool water addition. to do all these calculations. I do it with my home automation a Elk M1G. offset the bather load(in a residential pool only). The bottom line is that are is more than one way to maintain pool water chemistry. Ack!! I just accidentally wandered into the 'deep end'!! I understand your points, but I don't think we're really in that much disagreement. Basically, though we start off by telling people to measure and adjust water parameters, that's mostly so people can get a "sense" of their pools and what they need. Then, over time, people don't have to measure as often (at least for some parameters) if they "know" their pools better. That is, one starts off with measurements and adjustments to keep things in line and then transitions more towards what you are describing as practical ways of essentially maintaining the water chemistry the same as would be done with measurements. In my own pool, I don't measure chlorine every day, but rather twice a week before I normally add chlorine since I know its usage rate and never get too low (I have an opaque electric safety cover, so loss from sunlight is minimized). The problem we have found is that one can't really skip to the second stage as you have without first doing the first stage of measurements. The reason is that the factors in every pool are complex and not easily calculated. Yes, one knows that if sun hits the pool then there will be loss due to sunlight, but the exact loss depends on many factors including sun angle (time of year), pool depth, trees and other obstructions, CYA level, etc. Bather load is also a difficult variable since people sweat different amounts and this depends a lot on water temperature and level of activity. Chlorine demand from other organics depends on how much junk (leaves, pollen, etc.) gets into the pool and that can change over time depending on what gets caught in the filter, how often it is cleaned, etc. So I don't disagree with what you are saying and I'm glad you've found a timing approach that works well for you. I'm not so sure that the 100% SWG ontime only when the pump runs is necessarily more efficient. My understanding of SWG percentage is that when it's on, it's fully on, so the percentage is just one of the amount of on time during the pump run time. I don't think the SWG cell necessarily lasts longer trying to have it run 100% of the time that the pump is running. The pump run time should be based on circulation needs while the SWG percentage time (and when this occurs) should be based on chlorine demand and those are separate factors that may not coincide. I do agree with your "when to run the SWG" analysis such that it runs more frequently during expected higher demand. still digesting all this. quite a bit here and some interesting implications but no big surprises. We've always been pretty much on the same page, Richard! I accidently wandered in here myself and I think I got a Brian aneurysm. Hey Sean, you need to put a warning on this advance chemistry section. Just FYI -- this is not a new thread. Only the post from cliff_s was new and triggered this thread to show up in "View Posts Since Last Visit". The information on pool water chemistry is pretty old, much of it copied from the Pool Forum China Shop where I originally posted it here. Just FYI -- this is not a new thread. JCJR and Grace, aren't the graphs pretty? I thought my choice of color scheme was particularly well planned. I am sure glad that others are able to understand this stuff and debate/add to the findings because it benefits us all. Though Cyanuric Acid (CYA) absorbs ultraviolet (UV) radiation directly thus shielding the lower depths of water and protecting chlorine in those depths from breakdown, the primary result of having CYA in the water with chlorine (hypochlorous acid) is that it combines with chlorine to form a set of chemical species collectively called chlorinated isocyanurates (and these compounds also absorb UV without breaking down significantly). The full chemistry is complicated (well, tedious) because there are 6 different species of chlorinated isocyanurates (that is, chlorine attached to CYA) and 4 different species of Cyanuric Acid and its dissociated ions. There are 13 simultaneous chemical equilibrium equations of the CYA, chorinated isocyanurates, hypochlorous acid and their combinations though only 10 of these are independent from each other. In a very real sense, CYA acts as a hypochlorous acid buffer holding chlorine in reserve, but significantly lowers its concentration which determines the rate of any reaction in which chlorine participates. You can see from the structure of Hypochlorous Acid here that it looks similar to water with a chlorine atom substituting for a hydrogen atom. When chlorine combines with CYA, this is a chlorine substitution for a hydrogen atom or essentially an exchange of the chlorine atom to the CYA and the hydrogen atom from the CYA to make water. When chlorine is released from CYA, then the opposite exchange occurs. where for an FC/CYA ratio of 0.1 the factor is 0.38 while at a ratio of 0.2 the factor is 0.48. A very rough rule of thumb uses 0.5 and if one looks at the equivalent FC with no CYA then at pH 7.5 this is double the HOCl so the factor becomes 1. So how can one conclude what the dominant species are since that is the assumption I started with above? Let's look at the detailed equations and go through a process of elimination based on the pH. We'll start with the easier case to analyze, namely CYA and its dissociated species. Some of the following equations use an adjusted equilibrium constant for the ionic strength in typical pool water at 300 ppm CH, 100 ppm TA, 30 ppm CYA and 525 ppm TDS. All of the equilibrium constants come from the original 1974 O'Brien paper I refer to in the first post in this thread, but you can also see these constants (with some minor errors due to using slightly different sources) in this link on document page 12 ( PDF page 18 ). So this is where we get our initial assumption of H2CY- being the dominant cyanurate species where we can see that the next most dominant cyanurate species is H3CY. So the assumption that HClCY- is the dominant chlorinated isocyanruate species is reasonable and the next most dominant chlorinated isocyanurate species is Cl2CY-. In spite of the above equilibrium, the rate of release of chlorine from CYA is rather fast so all of the chlorine attached to CYA measures as FC in the FC test because the HOCl gets used up reacting with the dye in the test and more HOCl is released from that attached to CYA (or from hypochlorite ion) in the time of the test. All of the chemical equations are solved for explicitly through iteration (due to changes in ionic strength) in this spreadsheet. the original 1974 O'Brien paper is hard to find. It sounds like you have the 1974 O'Brien paper. Are you able to post it to the forum or provide a link to the paper? It's copyrighted material so I can't post it (at least not in its entirety). I have a copy of the out-of-print book that it is in: Chemistry of Water Supply, Treatment and Distribution that I refer to in my first post in this thread. I pretty much bought up the world's supply of that book sending it to the most important people in the world who should have that book -- the people on the committee defining the APSP-11 standards as well as the CDC and others who should be aware of the chlorine/CYA relationship and that this isn't new. The only copy I can still see available for purchase is here and it's much more expensive because, well, it's now more rare. Moreover, chlorinated cyanurates, in addition to acting as stabilizers, exhibit a limited degree of hydrolysis to yield a relatively constant level of germicidally potent, free chlorine. In other words, chlorinated cyanurates may be considered as analagous to a protected reservoir which liberates a small but relatively constant level of free chlorine in accordance with clearly defined principles of chemical equilibrium. Ordinarily, most of the reservoir chlorine consists of chlorinated cyanurates. Although these provide a readily available source of active chlorine, Andersen1 has submitted evidence that chlorinated cyanurates, as such, are not particularly germicidal. As a result, the germicidal activity must be borne by the relatively small fraction of free chlorine present at any given time. Since, in general, increase in cyanurate concentration results in decreased free chlorine, the use of large cyanurate concentrations to achieve maximum stability will tend to give inadequate germicidal activity. For the same reason the continual addition of chlorinated cyanurates as a source of chlorine is not recommended since this will lead to build up of cyanurate concentration and consequent repression of the concentration of free chlorine below that necessary for effective germicidal activity. Although chlorinated cyanurates serve as a reservoir of free chorine, bactericidal efficacy is more closely related to the relatively small fraction of free chlorine present at equilibrium. Therefore, the use of excessive cyanurate in an overly zealous attempt to reduce photolysis may repress free chlorine to the point of suppressing germicidal activity. For the same reason the continual addition of chlorinated cyanurates as a source of chlorine is not recommended because this will lead to build up of cyanurate concentration. 1. Anderson, J.B. "The Influence of Cyanuric Acid on the Bactericidal Effectiveness of Chlorine," Ph.D. Thesis, University of Wisconsin, Madison, Wisconsin, 1963. The paper defines "free chlorine" as being the sum of hypochlorous acid and hypochlorite ion while "reservoir chlorine" is free chlorine plus all chlorinated cyanurate species. In our modern terminology based on what is measured in the Free Chlorine (FC) test, FC is actually reservoir chlorine. So when the paper says that higher CYA levels lower Free Chlorine, they are referring to hypochlorous acid and hypochlorite ion, not to what we now call FC. Over the subsequent years, especially in the 1980's, a series of papers demonstrated chlorine's dramatic reduction in effectiveness in the presence of Cyanuric Acid. The most careful of such studies (this PDF file) shows that the germicidal effect of chlorine (against a species of protozoan cyst) is based on the hypochlorous acid concentration. Other studies show the effects against bacteria, viruses, algae and oxidative power (against amino acids). sending it to the most important people in the world who should have that book -- the people on the committee defining the APSP-11 standards as well as the CDC and others who should be aware of the chlorine/CYA relationship and that this isn't new. Are you making any headway with changing hearts and minds yet? What kind of reception are you receiving? I would think that the CDC - being scientists with no profit ax to grind - would be more receptive as compared to the APSP committee? In a couple of years, perhaps TFP will have a large enough following (and corresponding political power) in order to either influence the APSP committee. Or perhaps we will put our own people on the APSP committee. It's copyrighted material so I can't post it (at least not in its entirety). Have you considered contacting the publisher (Ann Arbor Science ? ) directly and asking them for permission to reproduce the paper for specific purposes? It is hard to imagine that Ann Arbor Science, if they even exist any more, really cares that much about an obscure 35 year old paper. If you wanted, I would volunteer to do some legwork on contacting the publisher for permission to reproduce this paper. Yes, if you could find out if the publisher still exists or got bought out and can get permission for me, that would be great. I don't have a lot of time to add something like that to my plate so you could certainly help me out. As for the APSP-11 developing standard, I gave rather extensive comments on it. I was very encouraged that it contained some information on the chlorine/CYA relationship though not to the level of detail I would have preferred so I sent some graphs and "rules of thumb" info in the comments. I have no idea what will come of it since there is no feedback process back to those who make comments. I proposed using an "FC as % of CYA" with a minimum FC as a standard and said that this wasn't that different than the LSI that is already a multi-parameter index and is referred to in the standard. I also made the radical proposal of allowing (at least not recommending against) a small amount of CYA for indoor pools. As for the CDC, they are very busy and generally underfunded and besides, they don't set pool standards. They are mostly just focussed on disease prevention. Nevertheless, I have written to them about possible ways of handling Crypto, but I'm probably just a PITA to them -- I don't have any relevant credentials and don't work in the industry. They've always been cordial, but I just don't think they have much time to devote to these issues.